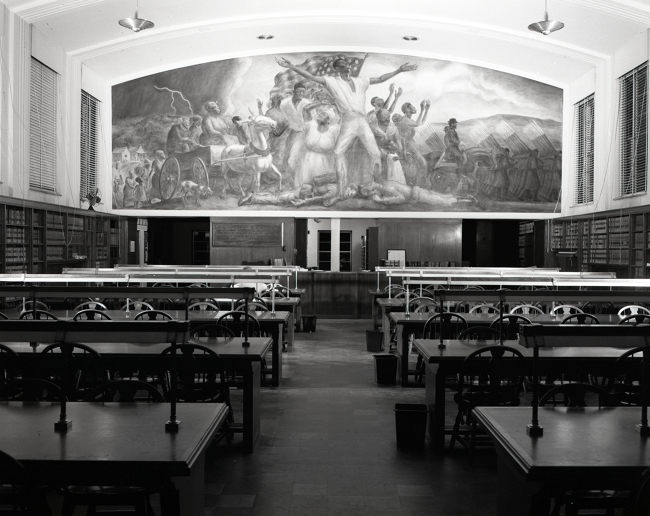 75th Anniversary of John Steuart Curry's "Freeing of the Slaves"
Black and white photograph of the Old Reading Room as it was at the time of the painting of the mural- with the circulation desk below and tables for study throughout the room. Painted in 1942 by American Regionalist artist John Steuart Curry, "The Freeing of the Slaves" mural still dominates the Law Library's Old Reading Room. Originally destined for the U.S. Department of Justice Building in 1936, the mural's design was rejected as too racially controversial for Washington DC. Curry's powerful sketches did, however, catch the attention of then-Law School dean, Lloyd Garrison. Grandson of famous abolitionist William Lloyd Garrison, Dean Garrison felt a strong connection to the work. Upon Curry's appointment as artist-in-residence at UW-Madison, Garrison approached the artist about painting the work in what was then the "new" Law Library Reading Room. Curry accepted and began work on the mural, which was located right above the bustling new circulation desk. Upon its completion, Curry wrote this of the mural: "I feel in this painting I have made a work that is historically true and I also feel that it is prophetic of that which is to come." In addition to the mural at the Law School, Curry painted other works on campus including "The Social Benefits of Biochemical Research" in the Biochemistry Building and a memorial painting to All-American David Nathan Schreiner located at the university's Chazen Museum of Art. A total of 37 artworks by Curry can be viewed as part of the permanent collection at the Chazen. For more information about the mural, see the framed history with comments by the artist and Dean Garrison on the west wall of the old reading room (formally known as the Quarles and Brady Reading Room). A reprint of an article about the mural which appeared in The Gargoyle also hangs on the west wall. * Full-color copies of this article are available at the Reference Desk. * Paul Reidinger, The Law School's Curry Mural: One of the Grandest and Most Distinguished Works of Art in Wisconsin, XVI The Gargoyle 10 (Summer 1985). More information and images can be found at the Links and Bibliography About John Steuart Curry and the Curry Mural page and the "Curry Mural Through the Decades" photo collection.